New movie staring Kevin Bacon with an original plot devise involving the Grand Canyon. Like the Forest early this year you have a neat idea and it has some cool visual effects and some creepy looking ancient villains The Anasazi Indians. They would appease spirit gods and their are some evil spirits trapped in some rocks. the main part of the story is decent and original. The young brother with Autism ( Bruce Wayne from Gotham, with real acting lessons) sees things other people don’t and the family ignores it until things get creepy. The sides story with the older sister weight loss problems the father cheated once its all really boring and slows the main plot down to the point you don’t care about the rest of the movie. if you like Kevin Bacon films its ok but his best horror movie was Stir of Echos. the director Greg McLean also directed Wolf Creek and Wolf Creek 2. Staring Anton Yelchin and Patrick Stewart a band in desperate need of a new gig takes one at a club run by a group of Neo Nazi. When this discover a dead body it becomes a cat and mouse game between the skin heads and the band. Its funny to see two actors from two different eras of Star Trek in the same movie together on different sides of the story. Its a cool suspense story with a couple really gory moments. Patrick Stewart is great in the movie as the leader of the bad guys, but this is not his most riveting performance ever. He stands around and delivers dialog that’s really it. he seems to just read the lines in that awesome voice. If you like Stewart its a movie to check out. Yelchin is pretty good as the band leader trying to get his friends thru the ordeal. the movie is directed by Jeremy Saulnier who also wrote and directed Murder Party, which is also a really great little indie horror movie. 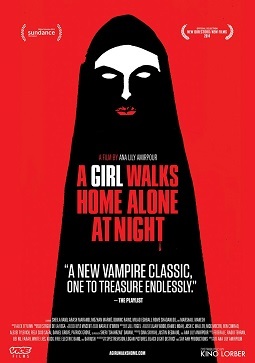 Residents of a worn-down Iranian city encounter a skateboarding vampire (Sheila Vand) who preys on men who disrespect women. A black and white artsy Vampire movie that is different than the norm we have seen. It can be a little pacy at times but I really enjoy Ana Lily Amirpour is an Iranian-American film director, screenwriter, producer and actor. She has a great sense of style. A moody movie with a great soundtrack. I recommend it if your a big fan of unique vampire movie.